If you do the crime, you have to do the time. Amongst Marvel Cinematic Universe stars, the worse crime you can commit is spoiling an upcoming movie — and the punishment for doing so is harsh. 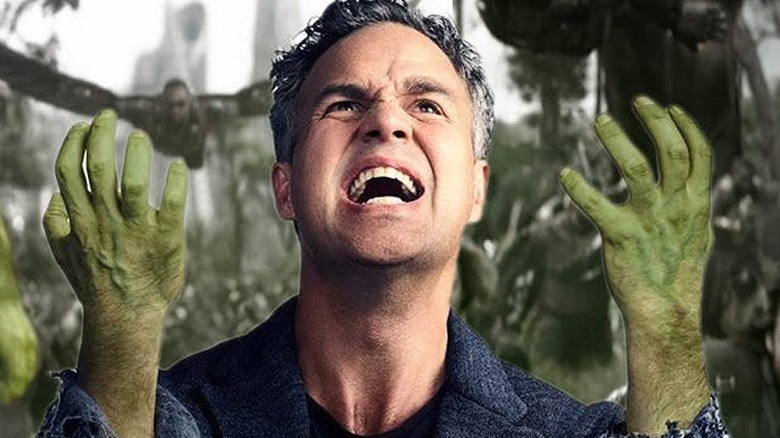 No one knows that better than Mark Ruffalo, known in the MCU as the super-smart scientist Bruce Banner and his not-so-jolly green giant alter ego Hulk, who has been "fired" from Avengers 4 for accidentally revealing the forthcoming film's official title. During a Q&A session held on Thursday, November 8 at the Duello Bar in Los Angeles, Avengers 4 co-director Joe Russo opened up about the impending superhero sequel. Naturally, the filmmaker touched on the spoiling Ruffalo — and Spider-Man actor Tom Holland, who has time and again dished up details he probably wasn't allowed to — has done recently. Asked how he and his brother Anthony Russo, who also stands behind the Avengers 4 helm, have dealt with spoiler-spillers like Ruffalo and Holland, Russo shot a look at his bartender, who said, "Didn't you fire Mark Ruffalo?" (via We Got This Covered). Russo gave a simple response: "Yes, we fired [him]. Mark's fired." It wasn't as though the Russos, who tortured Marvel fans by killing off some of their favorite superheroes at the end of Avengers: Infinity War, made the same kind of snap decision Thanos did when he slashed the universe's population in half. A fateful appearance on a talk show led to Ruffalo's fake "firing," which has become a running joke between the actor and the directors. Let's take things back to the start of this whole situation. At the beginning of October, during an appearance on The Tonight Show Starring Jimmy Fallon, Ruffalo apparently slipped up and stated out loud the title of Avengers 4, something the Russo Brothers and the bigwigs at Marvel have kept secret due to the fact that it's reportedly a spoiler for Avengers: Infinity War. The Hulk actor headed to Twitter following the taping to send a tweet to Fallon, asking the late-night host to edit the episode and remove the footage that features him spoiling Avengers 4. ". @JimmyFallon, I trust that you will cut my spoiler slip on the show tonight. That was 'off the record' homey," Ruffalo tweeted on October 5. "Please don't get me in trouble with Marvel (Barry) again. DM me back. M."
Clearly, Ruffalo formatted the tweet to look like it was a direct message he intended to send to Fallon's Twitter inbox but accidentally posted to his account, where his 4 million-plus followers could read it. And while the actor didn't technically end up revealing anything about Avengers 4 that he shouldn't have during his chat with Fallon on The Tonight Show, as the spoiler was ultimately censored and a black bar was placed over Ruffalo's mouth in the cut that aired on television, Joe and Anthony Russo jumped at the chance to make a joke out of it all. Once the directing pair caught sight of Ruffalo's social media post, they gave the actor the boot — all in jest, of course — and have kept the gag going ever since. Ten days after Ruffalo's misstep, the Russos uploaded a cryptic photo to their joint Twitter page, celebrating the end of filming on Avengers 4. Ruffalo responded to their tweet, poking fun at how unfair it is that they can share anything they want but he got fired for dropping Avengers 4 info. "You fired me for a measly slip of the title? Spoiler alert!" wrote Ruffalo. The Russo Brothers then quipped back, "You're still fired, Mark." As for the title that Ruffalo supposedly let slip on The Tonight Show, one Marvel fan did some impressive audio-editing to undo the censor and discover what the actor said. Twitter user Anton Volkov imported the audio from Ruffalo's interview with Fallon into the Abode editing toolset Audition, then utilized the "spectogram editor" to attempt to remove the bleep. According to Volkov, Ruffalo told Fallon that Avengers 4 is titled The Last Avenger — which would neatly, sweetly connect to Captain America: The First Avenger from 2011. However, someone who was in attendance at the Tonight Show taping shot down Volkov's speculation, stating that the whole thing was "a bit" and that Ruffalo told the audience during a commercial break that what he said wasn't true. Since Ruffalo is confirmed to appear in Avengers 4, he likely hasn't legitimately been fired. Though, considering his track record of spoiler-revealing — from accidentally live-streaming on Instagram the opening of Thor: Ragnarok to stating almost a year before Avengers: Infinity War's release that "everybody dies" in the film — we can forgive fans for believing that he truly has been kicked out of the MCU. Unfortunately, fans will have to wait a little longer to learn what the true title of Avengers 4 is — whether it's The Last Avenger like Ruffalo is rumored to have mentioned, or one of the various other options (including Avengers: Eternal, Avengers: Annihilation, Avengers: End Game, and Avengers: Disassembled) that have floated around the internet. According to Marvel head honcho Kevin Feige, the studio is holding off on revealing the Avengers 4 title until the end of 2018. Hopefully Marvel enthusiasts can keep patient — and stop themselves from hulking out — before then.